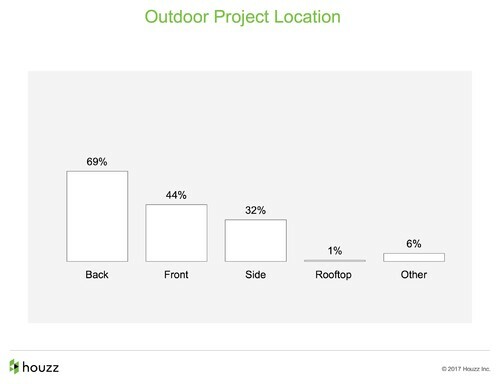 If you’re thinking about upgrading your outdoor spaces and would like to get a sense of cost and timelines, we’ve got some data for you. The 2017 U.S. Houzz Landscape Trends Study, fielded in February and March 2017, reflects the responses of 977 registered U.S. Houzz users who own homes and completed an outdoor project in the past 12 months, were working on one or plan to start one in the next three months. It reveals how homeowners are currently updating their yards, how much they are spending and what upgrades are popular. Read on to learn what’s trending now in American outdoor spaces. How much people spend. As with all renovations and home projects, costs can range quite widely, depending on the work done and the labor costs in the location where the project takes place. That said, the results of the survey reveal some interesting price trends. 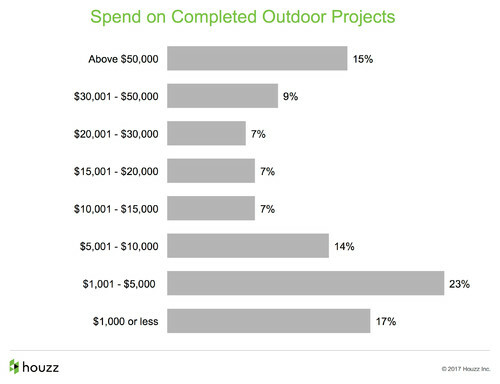 The most common level of spending for an outdoor project is between $1,001 and $5,000, the survey found. A total spend of $1,000 or less is the second most common price level. Before you get too overjoyed at these price tags, it’s worth noting that many of the lowest price tags are, not surprisingly, for smaller projects. A total of 73 percent of minor outdoor projects came in at $5,000 or less. Projects categorized as minor involve smaller-scale work such as mulching, minor planting and painting. In comparison, only 23 percent of projects categorized as complete overhauls — involving work like regrading, terracing and relandscaping — fall into that price range. 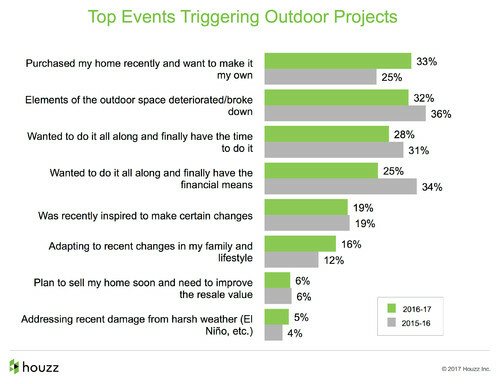 Fifteen percent of people spent more than $50,000 on their outdoor projects, and many of those projects were complete overhauls. Cultivating curb appeal. 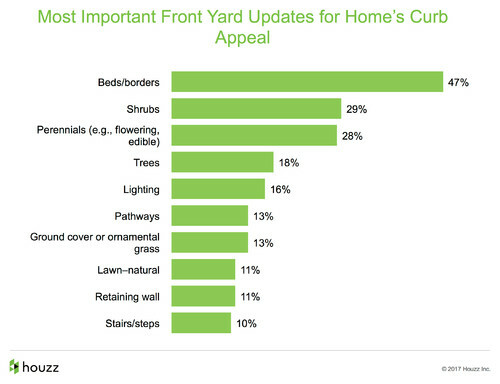 Of those addressing the front of their homes as part of their outdoor projects, nearly half (47 percent) consider updated beds or borders as most important to their home’s curb appeal. Twenty-nine percent are employing shrubs, and nearly as many are including perennials. Standing out is on trend. When people do address their street-facing outdoor spaces, they’re unlikely to want to blend in with the rest of the neighborhood. Thirty-six percent of owners renovating outdoor spaces report that before their projects, their front yards were nearly identical to those of their neighbors. 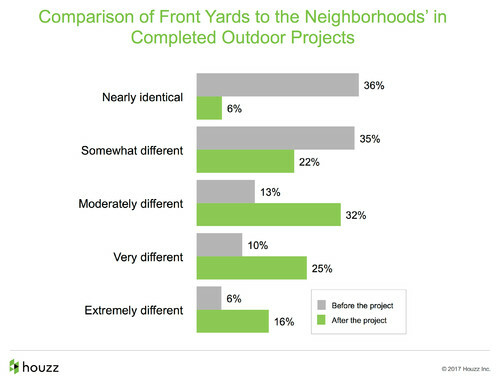 After the outdoor project, only 6 percent of front yards remained nearly identical to others in the neighborhood. Forty-one percent, by contrast, are very or extremely different from those of the neighbors. Chatting more with the neighbors. 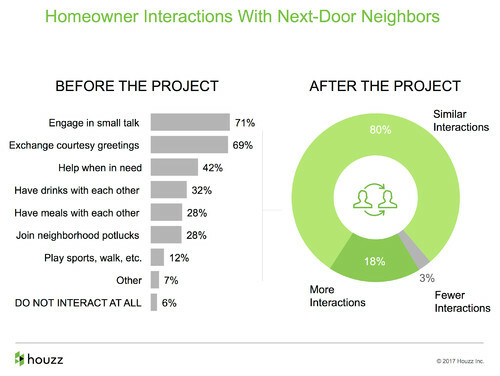 While the majority of homeowners are enjoying a similar amount of interactions with their next-door neighbors after the outdoor project as before, a significant slice — 18 percent — say they are interacting more with their neighbors since their outdoor projects were completed. Biggest problem areas. 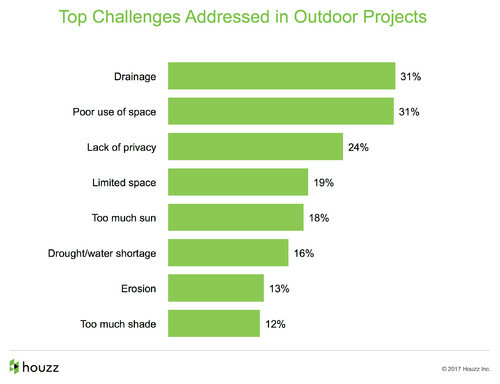 The most common challenges being addressed during outdoor projects are drainage and poor use of space. Lack of privacy comes in as the third most common problem area that homeowners are tackling. Motivations for tackling outdoor projects. Homeowners surveyed say that purchasing a home and wanting to make it their own was the No. 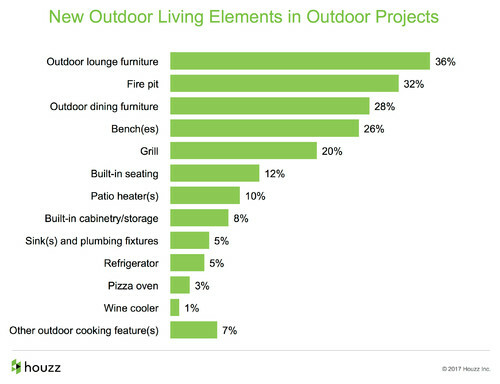 1 reason they wanted to address their outdoor spaces. 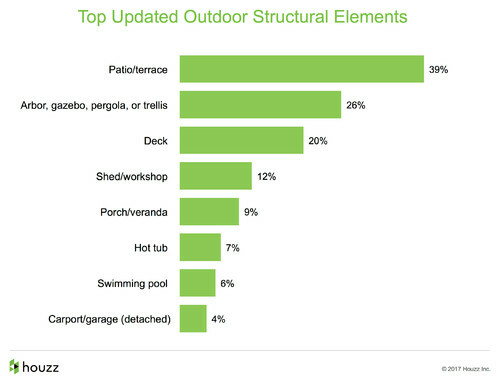 Wanting to address components of the outdoor space that were past their prime came in a close second. A quarter or more of survey respondents say they had wanted to do the project all along and finally had either the time or the money. How long does it take? When it comes to completing an outdoor improvement project, the planning time varies significantly, depending on how big the project is. 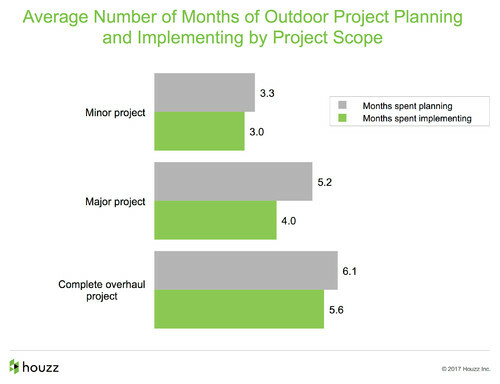 Among survey respondents, minor projects involved an average of just over three months of planning and three months of implementation. The biggest projects, which we refer to as complete overhauls, averaged slightly more than six months to plan and just over 5½ months to implement. Major projects include substantial updates like paving, putting in new beds, and building or upgrading structures or both. But they don’t reach the level of complete overhauls, which include work like relandscaping and reterracing. Now we can relax. 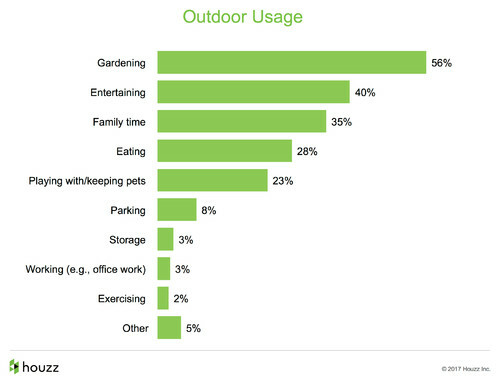 Two-thirds of homeowners with outdoor projects are using their outdoor spaces for relaxing, the study found. 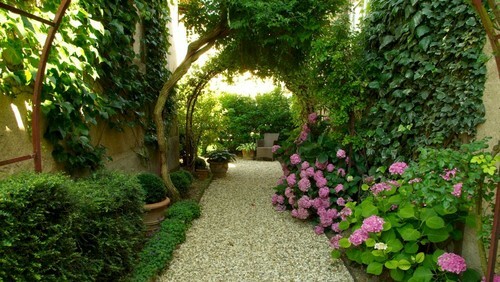 Over half garden, while 40 percent are using outdoor spaces for entertaining. And we need furniture to do it. 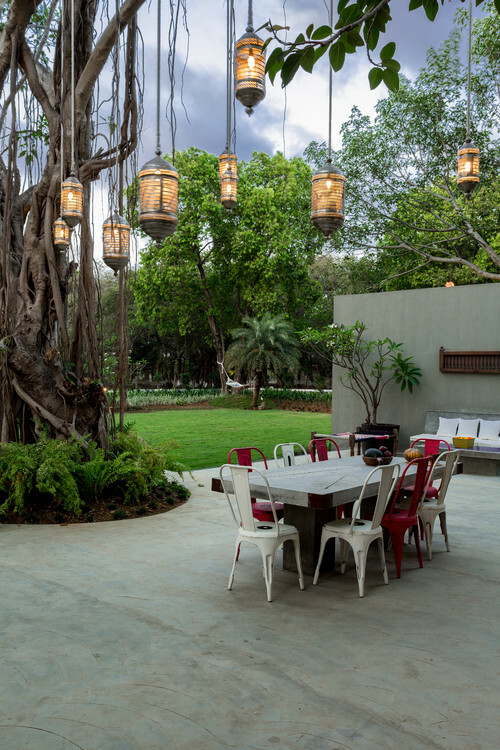 All that relaxing requires some comfy furniture, and owners tackling those outdoor projects tend to acquire outdoor lounge furniture for the cause. Anyone dreaming of an outdoor sofa? Low-maintenance plants are popular. 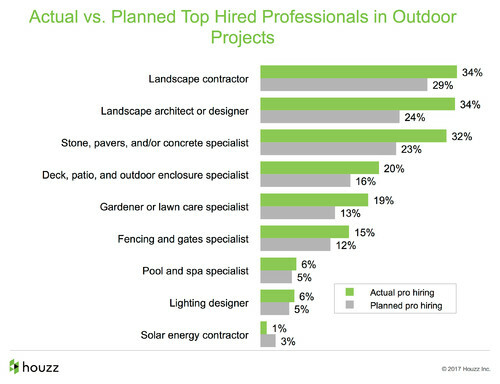 Surprisingly, given all these relaxation lovers, just one in five outdoor renovators is planning to hire professional help to maintain outdoor spaces. 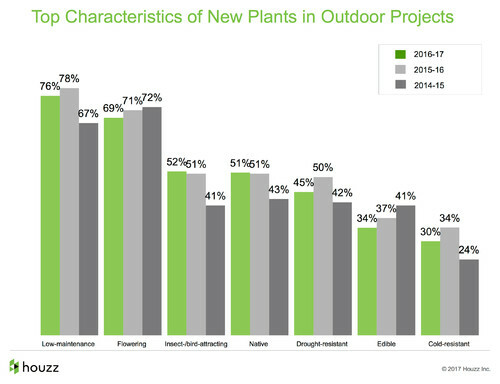 No wonder low-maintenance plants are so popular — in fact, they were chosen by 76 percent of owners who have recently completed, are in the midst of or are planning to start an outdoor project in the next three months. Another interesting trend is that among the 75 percent of homeowners who have an existing lawn, three-quarters have chosen to change it in some way. Back or side lawns are tending to get replanted or enlarged, whereas front lawns are much more likely to be removed. Structures and sheds get love too. Many homeowners are choosing to work on outdoor structures during their outdoor projects, with 39 percent upgrading patios or terraces and more than a quarter updating their arbors, gazebos, pergolas or trellises. Owners not pulling the weeds alone. Most homeowners — 73 percent — who completed an outdoor project in 2016 hired a professional. But only 63 percent of those who are planning or in the midst of a project say they will hire one. Our research team attributes the difference to the fact that some people don’t plan to hire a pro, but decide midproject that they actually do want to hire one. 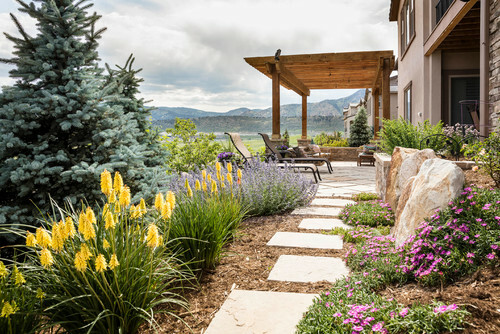 Of those who completed an outdoor project, one-third worked with a landscape architect, one-third with a landscape contractor, and nearly as many hired a stone, paver or concrete specialist.